Let’s face it – the quantum leap that happened when we made the jump from black-and-white TV to full color TVs were mind blowing at the very least. I suppose it was almost the equivalent of being able to hear sound on the TV for the first time after being weaned on silent movies all along. 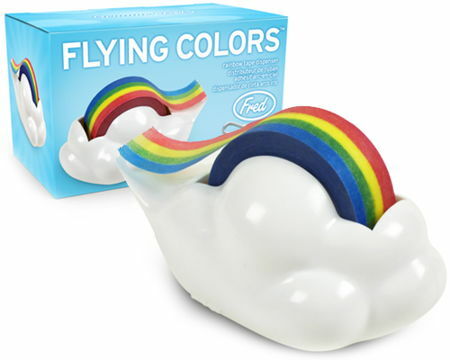 Well, if you love to complement your cheery personality at the office, why not drip with perpetual sweetness with the $11.99 Flying Colors Rainbow Tape Dispenser? With this, every day can be a happy one – after all, rainbows do have this effect of cheering people up, right? It won’t look so professional on your work folder though.